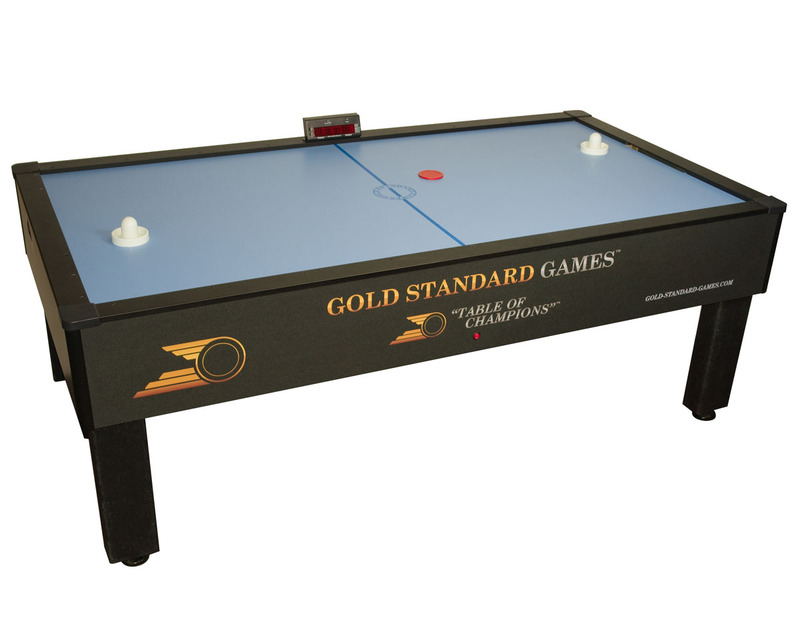 he Air Hockey Table by Gold Standard Games - Home Pro Elite is perfect for your game room! Endorsed by champion players Danny Hynes and Tim Weissman, and designed by 2-Time Champion Mark Robbins, this table features solid, pro-style aluminum rails for unmatched bounce and bankability. It also boasts of a playing field with a special, wear-resistant laminate surface that ensures years of durability. Other great features are a full-size 3 3/16'' diameter puck designed to remain on the table, a centerline and face-off circle for competitive play, electronic scorer with sound option, 12'' apron height, and 3.5'' x 5.5'' solid-core polymer legs. Dimensions of this item are 85.5'' x 45.5'' x 31''. Buy the Home Pro Elite Air Hockey Table by Gold Standard Games today and enjoy a 1-Year Comprehensive Manufacturer's Warranty!